Quebecor, the parent company of Videotron, has announced its vision to change the Canadian wireless landscape. CEO Pierre Dion today outlined the company’s goals speaking at the 2014 Canadian Telecom Summit. Dion says the company wants to bring a new low-cost wireless service to Canada, similar to the data and roaming plans available in Europe and Australia. The plan for Videotron is to offer those outside Quebec “the country’s best low-cost subscriber plans.” Videotron was able to win 7 licenses in the federal government’s recent 700MHz spectrum auction, giving it the potential to launch in Alberta, BC, Ontario. 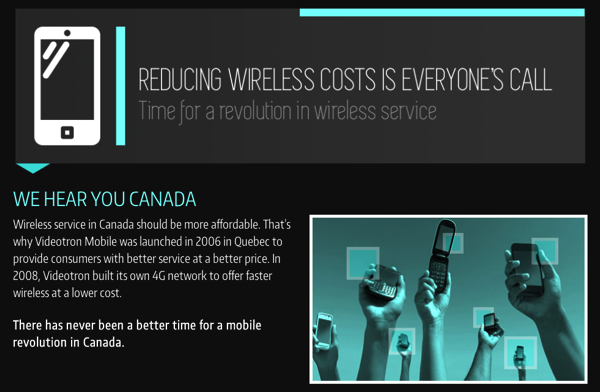 To further its goal of spreading the word, the company has created a new website called AffordableWireless.ca, which spreads its low-cost wireless message with the tagline “Reducing wireless costs is everyone’s call” to lobby the government. Looks like Quebecor is ready to take Videotron national—but they won’t do it unless they get fair roaming rates from the Big 3. Last month former Prime Minister Brian Mulroney was named the Chairman and CEO of Quebecor, most likely to leverage his connections in Ottawa. Would you switch over to Videotron if they become Canada’s viable ‘fourth’ wireless carrier? This is great news for everyone if it can come to fruition.